Old stove went out on schedule, and more surprisingly new stove was delivered and hooked up on schedule. I’m still forming my opinion of the new stove. On the plus side, it heats up and stays hot even after you put something in to cook (which is what our old oven wasn’t doing that precipitated the call to our Landlady and the acquisition of a new stove). The desserty bread thing I baked on Monday night did not burn on the bottom, which was another failing of our old oven, although the rest test will be cupcakes which always always burned in our old oven no matter how you tried to fiddle the temperature and baking time. On the minus side, it’s black. This wouldn’t seem like a downside, but it means it shows every single fingerprint and smudge and inadvertent drip of water and I object to needing to wipe the stove down every time I so much as brush past it. It’s not even like this is one of the things I’m uptight about, I wipe my stove down when I finish cooking or if I spill something on it, but in general I just can’t get exercised about a watermark or two, but the black finish makes it look like you haven’t cleaned your stove top in a week the instant you splash some water on it. Also on the minus side, it’s both narrower and shallower than our old stove. This is problematic. The narrower means that the space between the right and left hand sides of the stove is smaller which translates to less space to set down measuring cups, spoons, pot lids, etc. If there was a counter near the stove this wouldn’t be a big deal, but our stove sits in splendid isolation across the kitchen from any counter space, and the placement of the pantry and the fridge prevent me from just sticking a small table to one side or another to act as counter space. It’s also shallower, which means that I don’t think I can fit a large (12”) skillet and a large (stew) pot back to front at the same time. This is deeply problematic because this is an arrangement I engage in frequently when cooking Dinner. There also doesn’t seem to be an intermediary temperature between so hot it welds things to the bottom of a pan, and not hot enough to brown meat. I’m hoping that this is just because I haven’t spent enough time playing around with the stove yet because it’s a gas stove and theoretically it should just be a question of the height of the flame. It’s possible I’m just being fussy and churlish and resistant to change. In fact, I’d say all those things are in fact distinctly likely. 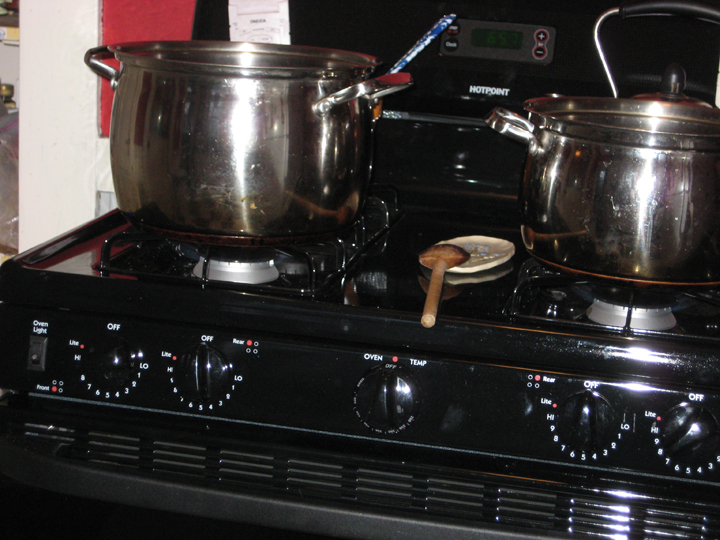 It’s also possible that the new stove is slightly less functional (for the way I cook) than my old stove was – although, admittedly, the fact that it works is a distinct bonus. It’s also possible that all of the above is true and I’m just being cranky because it’s not the stove I would have chosen had I been given a choice and I haven’t had a chance to adapt to the new stove yet. This is what I was craving last week and then had to nix because I was minus a stove. It’s actually not what I’m craving this week, but I already had the ingredients on hand so it’s what we’re having anyway. What I’m craving this week is scheduled for next week’s Dinner. Unnecessary, but does one really need excuses to serve goat cheese? I took advantage of my bi-annual urge to bake and made dessert. This falls somewhere in between cake and tea bread. It’s a little hearty from the oats, but sweet from the sugar. 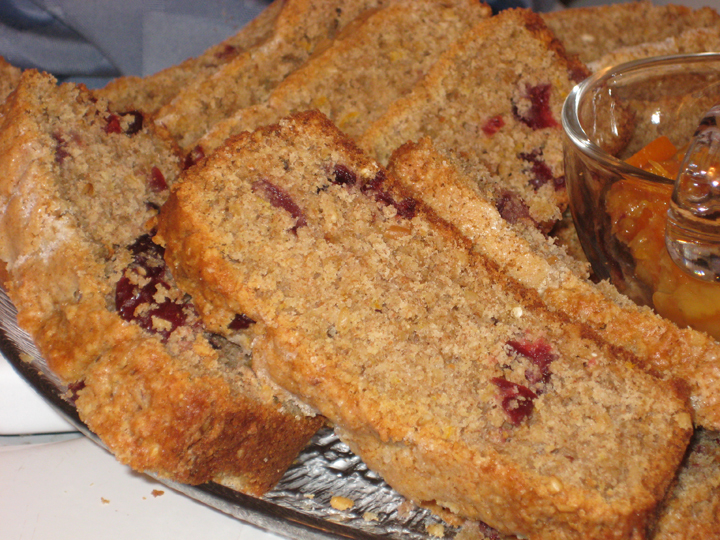 If you wanted to make this into more of a breakfast type loaf I think you could decrease the sugar to ½ cup. I served it as dessert with some (spectacularly good) marmalade on the side. I cut it into 12 slices, and the bread is crumbly so I don’t think I could have cut it any finer than that. I took the second loaf to work and left it in the kitchen where it (apparently) caused the WB Mason guy to spontaneously proclaim an offer of marriage. In a medium sized bowl, pour the buttermilk over the steel cut oats and let them sit for 30 minutes. Prep two (8×4”) loaf pans* (or two 8” pie pans) by buttering each pan and dusting with flour (I also used a parchment sling to make sure they’d unmold, but I’m paranoid). Meanwhile sift together the flours, baking powder, baking soda, spices, and salt. In a separate bowl whisk together the oil, egg and sugar. When the oatmeal has soaked add it to the wet ingredients. Add the cranberries and whiskey. Stir the dry ingredients into the wet and pour into prepared pans (batter will be wet). Drizzle with melted butter and sprinkle with a handful of raw sugar (or if you can’t find it, a sprinkle of plain sugar works just fine). 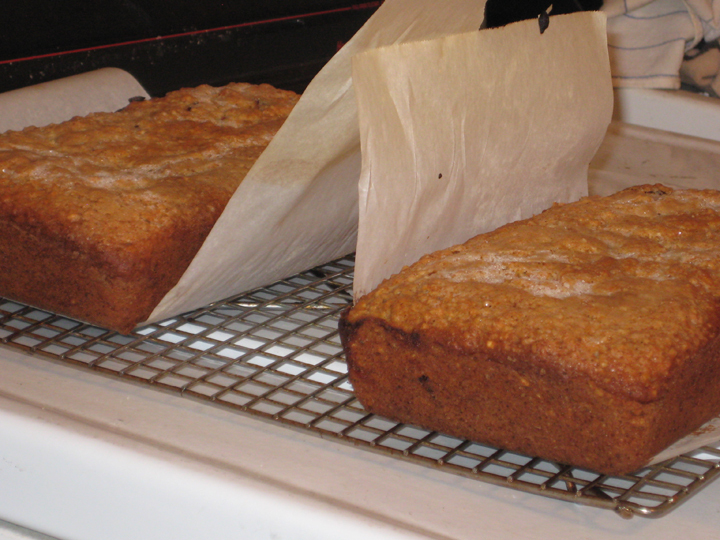 Bake for 40 minutes or until a cake tester inserted comes out dry. Let cool for 5 minutes before removing pan – cool on a wire rack. * The original recipe didn’t specify the pan size so I ended up baking it in two 9” loaf pans which made for wider, flatter loaves. Next time I’d do it in 8” loaf pans to get the more familiar domed loaf shape.